Augustus Funeral Home regrets to announce the passing of Mrs. Cynthia Marvagene Cooper. 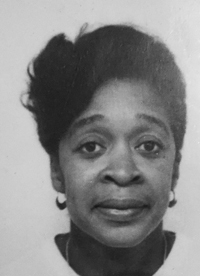 A Memorial Service celebrating the life of Cynthia Marvagene Cooper beloved wife of the late Ronald Cooper of 5 Robert’s Alley, Devonshire HM16 in her 75th year, will be held at Christ Church, Middle Road, Devonshire, Today, October 13, 2018 at 4p.m. Cynthia leaves to cherish her memory her Children: Dawn Cann [Alan] and Chriss Thomas, Grandchildren: Chrishan Thomspon, Chrisjon Simmons and Rokeyah Brown; Brothers: Edward Harvey [Beverly], Anthony Butterfield and Kevin Warner; Sisters: Cloretta Harvey, Donetta Smith and Sabrina Smith; Brother-in-law: Allan Cooper [Vivlyn]; Sister-in-laws: Ileys Morton [Stanley] and Rochelle Dill; Niece: Renee Harvey; Special Cousins: Joan Drummond and Barbara Middleton; Godchildren: Lanel Roberts, Alicia Swan, Zuri Taylor, Crystal Todd, Kareen Richardson, Duvall Smith; Special Friends: Gloria DeGraff Smith, Patricia Stovell, Leonie Dublin, Sheila Lambert, Enid Whitter, Marion Botelho, Calvin Minors, Graham “Bow” Outerbridge, Earlston Woodley, Benjamin “Benji” Francis, Henry Smith, The Morning Crew, The Ex-Artillerymen’s Association, and numerous other relatives and friends. Cynthia was predeceased by her Father Rupert Chesley Alick, Mother Madge Tuckett Harvey, and Aunt Eldika Tuckett.